EPDM Coatings LLC maintains this site for your information and personal use. Access to and use of this site are subject to the terms and conditions set forth below. EPDM Coatings is a distributor for Proguard Coatings; manufacturer of the only Liquid EPDM Rubber in the world. At EPDM Coatings LLC, your online credit card transactions are secure. We use Secure Socket Layering (SSL), the standard encryption technology that ensures safe Internet transmission of your personal information. Within our secure order form, depending on your browser you will see a padlock at the bottom right of your browser, you may receive a pop-up message telling you that you are entering a secure area or the letters "http" in the URL will change to "https" indicating you are in a secured area employing SSL. Upon receiving your credit card statement you charge for Liquid Roof will be reflected by a charge by EPDM Coatings LLC. While EPDM Coatings LLC makes all reasonable efforts to ensure the information and materials contained in this Site are accurate, EPDM Coatings LLC makes no representations or warranties as to the accuracy, reliability or completeness of the information, text, graphics, links or other items contained in the Site or in any site linked to or from the Site. EPDM Coatings LLC expressly disclaims liability for any errors or omissions in the materials contained in the site or in any site linked to or from the site. You agree by purchasing the products offered that EPDM coatings is not responsible for any damages and/or failures in the products. All product warranties are for defects only and do not cover guaranteed adhesion. You are also responsible for determining if the products you are considering are proper for the type of RV, Roofing system or application you are considering. EPDM Coatings LLC reserves the right to make changes in the programs, policies, products and services described in this site at any time without notice. Customer accepts all responsibility for orders left at shipping address they assigned. Should a signature be required for acceptance you must contact EPDM Coatings prior to ordering so we can note the order. EPDM Coatings is not responsible for any order deemed to be missing/stolen. Proof of delivery is provided by FedEx or our carrier on all orders. For our customers' convenience, EPDM Coatings LLC may provide links to other sites. In addition, links to this Site may be provided from other sites either known or unknown to EPDM Coatings LLC. EPDM Coatings LLC is not responsible for the content of any site that is linked to or from this Site. Linked sites to or from this Site does not imply that EPDM Coatings LLC, sponsors, licenses,endorses, is affiliated with or is otherwise connected to the site, the products or services described therein or its owner; and EPDM Coatings LLC has authorized the linked site to use any trademark, trade name, logo or other trademarked or copyrighted material of EPDM Coatings LLC. Returns are not accepted after 7 days of receipt. ALL RETURNS MUST HAVE A RETURN AUTHORIZATION FORM ATTACHED TO THE OUTSIDE OF THE BOX SO THE RETURN CAN BE SCANNED AND WILL BE REFUSED. Simply contact our office with you original order number and we will e-mail you the necessary RMA form. You agree not to hold EPDM coatings responsible for orders that are sent without an RMA affixed on the outside of the box so the warehouse can scan it upon receipt. Failure to do so will result in refusal of packages. A restocking fee of 20% will be deducted on all returns. Clients agrees to pay reasonable attorney fees and collection costs incurred by EPDM COATINGS, and give their personal guarantee as to any outstanding payments. On our order form we ask that you confirm your order before submission and verify the information you completed. Please be sure your order is correct before submitting. EPDM Coatings LLC is not responsible for errors make by its customers. If you do not want your order to be left at your home by FedEx in the event you are not home, you must contact our office so we many issue a proof of signature on your order. EPDM Coatings is not responsible for orders that are delivered but are missing. If you have not requested a signature required proof you agree not to hold EPDM Coatings responsible for any packages left at your location. EPDM Coatings LLC retains all order forms processed over its Web site and sends out responses confirming the information entered in the order forms. We will gladly replace any items you receive that have been damaged by the carrier. It is the consumer's responsibility to check the order before the shipping company leaves. Should you not want FedEx to leave your order at the door when you are not at home, you must contact us prior to the shipping of your package. Once the shipping company has left, you have accepted the order and verified that it was not damaged. Sundry items such as tape, caulk, and fabric and mixers are non-returnable. There are no returns on orders over $1000.00. 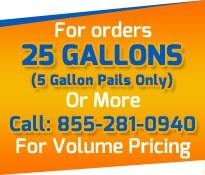 Deposits on orders of 100 gallons or more are non-refundable. EPDM Coatings is not responsible for returns you make to any address or warehouse point of shipment other than the address we provide. By placing your order, you agree you will not refuse shipment or attempt a chargeback on any valid order placed. Warranties are based on the material being applied to the original surface, such as sheet EPDM, metal (coated or galvanized steel, weathered aluminum or weathered copper), EPDM rubber membrane, concrete (except foot traffic surfaces such as decks, patios or asphalt-based materials), urethane foam, primed wood fiberglass, PVC sheet and pipe acrylic sheet, sponge rubber insulation, EPDM rubber membrane on flat or sloped roofs, weathered steel siding, weathered fiberglass, weathered standing seam or corrugated metal roofs, weathered vinyl, PVC and polycarbonate plastic, foam insulation for pipe, or cast concrete foundations. Warranties are not provided for application on top of other applied materials. Using third-party materials under or on top of Liquid Roof or Liquid Rubber voids warranty. On our order form we ask that you confirm your order before submission and verify the information you completed. Please be sure your order is correct before submitting. EPDM Coatings LLC retains all order forms processed over its Web site and sends out responses confirming the information entered in the order forms. We gladly replace any items you receive that have been damaged by the carrier. It is the consumer's responsibility to check the order before the shipping company leaves. Any returns are subject to restocking and/or re-canning fees. Once the shipping company has left, you have accepted the order and verified that it was not damaged. Commercial accounts must provide their ASDI number for damaged returns and arrange with the warehouse for freight deliveries. You will need to contact us for an RMA number prior to shipping. EPDM Coatings is not responsible for returns you make to any address or warehouse point of shipment other than the address we provide. Once on-line orders are placed they cannot be canceled due to the automation of the 3rd party fulfillment company who ships out our order. We will of course gladly return any unopened boxes simply call us for a return authorization form once you have received the packet. ALL INFORMATION ON THE WEB SITE IS PROVIDED TO USERS ON AN "AS IS" AND "AS AVAILABLE" BASIS WITHOUT WARRANTY OF ANY KIND EITHER EXPRESS OR IMPLIED, INCLUDING BUT NOT LIMITED TO THE IMPLIED WARRANTIES OF MERCHANTABILITY, FITNESS FOR A PARTICULAR PURPOSE, AND NON-INFRINGEMENT. USE OF THE WEB SITE AND THE CONTENT AVAILABLE ON THE WEB SITE IS AT THE SOLE RISK OF THE USER. ANY AND ALL CLAIMS FROM CONSUMERS ARE TO BE MADE DIRECTLY TO THE MANUFACTURER AND BY PURCHASING LIQUID ROOF ON THIS SITE YOU AGREE TO HOLD HARMLESS EPDM COATINGS LLC OF ANY AND ALL LOSSES ARISING OUT OF THE PRODUCT WEATHER DIRECT OR INDIRECT. EPDM COATINGS, LLC DOES NOT WARRANT THAT USE OF THE WEB SITE WILL BE UNINTERRUPTED OR ERROR-FREE AND IS NOT RESPONSIBLE FOR THE ACCURACY OR RELIABILITY OF ANY OPINION, ADVICE, OR STATEMENT MADE THROUGH THE WEB SITE. IT IS THE RESPONSIBILITY OF EACH USER TO EVALUATE THE ACCURACY, COMPLETENESS, OR USEFULNESS OF ANY INFORMATION OR CONTENT AVAILABLE ON OR THROUGH THE WEB SITE. USERS ARE RESPONSIBLE FOR TAKING ALL PRECAUTIONS NECESSARY TO ENSURE THAT ANY CONTENT THEY MAY OBTAIN FROM THE WEB SITE IS FREE OF VIRUSES OR ANY OTHER DESTRUCTIVE PROGRAMS OR CODE. WARRANTY QUESTIONS REGARDING THE PRODUCTS WE CARRY MUST BE TAKEN UP DIRECTLY WITH THE RESPECTIVE MANUFACTURER. EPDM COATINGS AS A DISTRIBUTOR IS NOT RESPONSIBLE FOR THE PERFORMANCE OF THE PRODUCTS IT CARRIES. © Copyright 2012 EPDM Coatings LLC. All Rights Reserved.